How to deal with and how to protect your personal data is a great concern to us, and that is why we would like you to read the following privacy notice. We only use your data for processing your order. All data of customers will be saved and dealt with under compliance with the regulations in this connection of the "Bundesdatenschutzgesetze" (BDSG) and "Teledienstdatenschutzgesetzes" (TDDSG) (laws to protect your privacy). We will only save the data that is necessary to process your order. That is the reason why we intentionally refrain from the possibility to creat a user account in which your data would be saved permanently. The secure transmission is also an important concern to us, and that is why your data will be safe because of an SSL encoding (secure socket layer) as soon as you go to checkout to purchase your products. (please use an browser with SSL enabled for that purpose because otherwise a secure transmission via SSL cannot be guaranteed.) If the SSL icon in your browser should not show a secure transmission, so that is because the shop is linked from another directory which has no negative influence on your privacy. You always have the right for free information, correction, locking and deletion of your saved data. 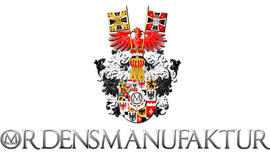 Please contact info@ordensmanufaktur.de or send us your request vie mail or FAX. We will not give your personal data including your home address and e-mail address to a third party without your explicit permission that can be revoked every time. Exceptions from that are our service partners that need your data to process your order (e.g. the shipping company that delivers your products and the bank that is responsible for payment affairs). In those cases however, the amount of data that will be transmitted is restricted to the required minimum.